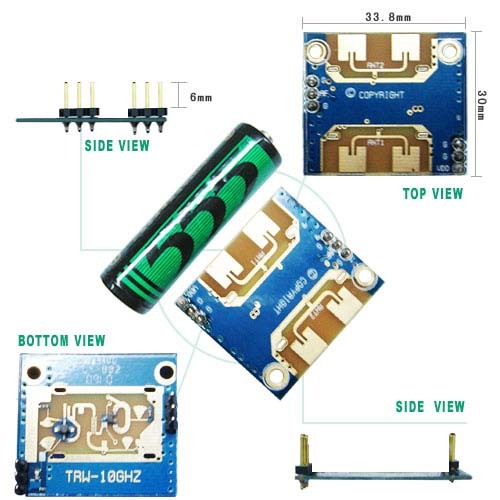 TRW-10GHz is high frequency radar transceiver module. It is using Doppler Effect Theory to detect frequency change when person or objects move. When it finish signal detect, it will output to MCU to detect or OP AMP voltage comparator to deal with signal strength. Performance of this module is different from PIR (Passive infrared sensor), PIR distance will be very short because of temperature changes. More stable, long distance, wide angle, high sensitivity, cost is lower than PIR and easy for using. It can use in various products. Whatever indoor or outdoor, you can design different products to fit difference place and environment. Using this module, you don´t need to waste energy, save electricity fees and extended product life to let energy-saving and minus carbon purpose coming true. It can widely use in automatic door opener, security system, automatic light sensor, traffic speed searching, traffic light signal control, office power management, intelligent control, medical probe and so on.